Today, we had the unusual luxury of a few hours off, sitting under an umbrella, watching people line up for a near death experience. These seemingly normal young folk jostled to get to the front of the line, so keen they were to hand over their hard earned money for the opportunity to climb a fifty metre tower in the middle of the tropical rainforest… and hurl themselves off! 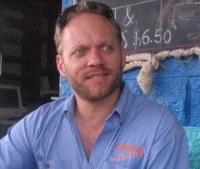 Yes, we visited A.J.Hackett’s famous Cairns bungy site. Neither Maria or myself had been there yet, and it’s just across the highway from Yorkeys Knob, so we felt it was about time we checked it out. 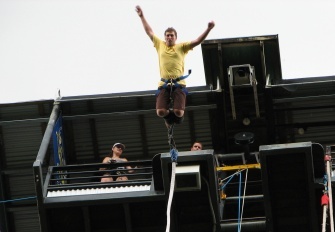 What’s more, we had just today booked five young daredevils to bungy and swing their way to palpitations, and we wanted to get in on the action… from a safe distance of course! The five teenagers weren’t looking their usual cavalier selves by the time Maria and I arrived at the jump site. They were craning their necks to see the top of the bungy tower, seemingly almost in the clouds. I think they were starting to wonder why they didn’t stay on their cruise ship, sipping cocktails and chatting up chicks. But there was no backing out; the piper had been paid, and besides… who would be the first 18 year old to wimp out in front of his mates? First came the Minjin Swing, which I struggled to catch on film. 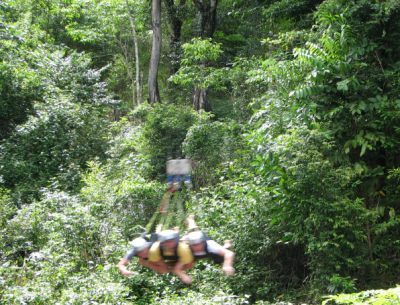 But if you believe A.J.hackett’s website… “Today the Minjin roars in the shape of the Jungle Swing, at speeds of up to 120 kph in 3.5 seconds”… it’s no wonder all my photographs were blurry. The Minjin Swing is - in a nutshell - just a very, very, very, very big swing. 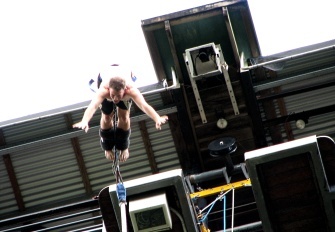 Safely harnessed, and in a lying position - kind of resembling Superman in flight - the hapless victim is hoisted backwards above the rainforest canopy until they are barely more than a speck to those left behind at ground zero. Then, in an instant, they find themselves hurtling through the air at highway speeds, swooping low over the spectator area and passing right across the roof of the kiosk. Of course, like the human pendulum that they have become, this action is repeated a number of times before the momentum wears off and they are able to be brought to a stop. This definitely got the boys’ adreanalin pumping, and they were eyeing off their next challenge, the gargantuan tower that loomed above us all. One by one, they took their turn on the gangplank, swandiving the height of a fourteen story building until splashing into the surface of the rainforest lagoon. Maria and I had to dash - we had a couple of digital underwater ameras to deliver in Cairns - but I’m sure the boys will still be on a buzz from their afternoon adventure. 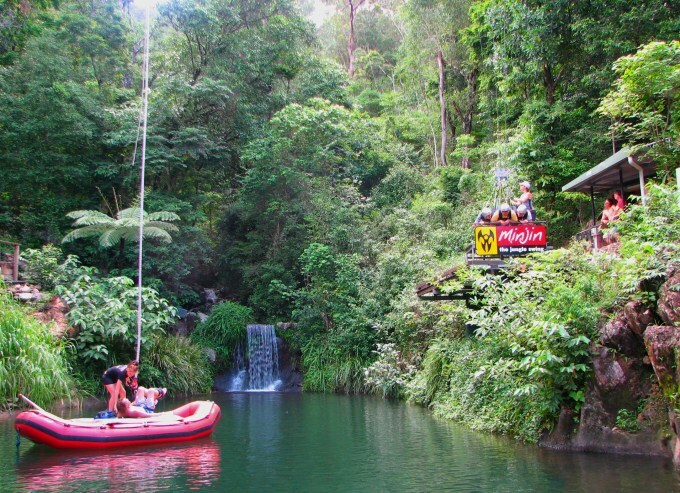 If you ever had any doubt that Cairns is the adventure capital of Australia, check out the range of adventure activities on our… you guessed it… Adventure Activities page. This entry was posted on Wednesday, February 20th, 2008 at 10:16 pm	and is filed under Adventure Activities. You can follow any responses to this entry through the RSS 2.0 feed. You can leave a response, or trackback from your own site.